Continental ContiTech HY-T Torque Team (Classical) Designed & Built to Deliver Superior Performance. HY-T Torque Team Classical belts are built with strong Vytacord® tension members.This provides the high-strength, high-horsepower rating capacity needed to effectively transmit drive power. And it’s tough enough to tolerate the misalignment that quickly destroys belts. The Vytacord material has a very good dimensional stability. ContiTech then adds a tough oil and abrasion-resistant fabric backing to provide maximum longitudinal flexibility and lateral strength to withstand the dynamic forces acting within a joined belt. 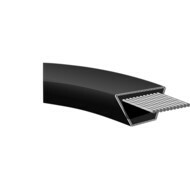 The backing also has special adhesion characteristics that enable it to bond inseparably to the V-sections to maintain the unitary integrity of the V- belt. The cushion in the envelope construction is fiber-loaded Plioflex®. Cut-edge constructions have a fiber-loaded, latest-technology compound that contributes heat and oil resistance and strength. Applications: Shop equipment, Light-Duty machinery, Home appliances, Blowers. See our pulley section and Contact Us if you have ant questions.